The VWR 1225 Digital Water Bath is an ideal choice for small applications needing repeatable conditions. This 6 Liter (1.58 Gal) and includes a microprocessor temperature controller with LED Display. This lab water bath was designed with safety in mind, with a recessed heating element that prevents burnout and fully insulated for great heat recovery and retention. The VWR Scientific 1225 6 Liter Water Bath comes equipped with a bath chamber of 11.5 x 5.9 x 6 inche and a temperature range of ambient to 99.9ºC, and a temperature uniformity of ±0.2°C at 37°C. Included is a gabled, stainless steel lid that helps retain temperatures, while channeling condensation away from dripping back onto samples. Parameters for this laboratory water bath are digitally controlled through a membrane keypad at the front of the insturment, with an independent overtemperature control and indicator. 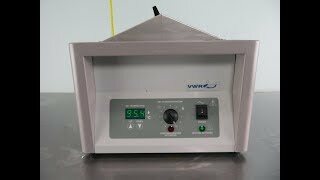 This VWR 1225 Digital Water Bath is in great working condition and comes complete with warranty. Should you have any questions, please don't hesitate to contact us.